The most common type of hybrid striped bass is a hybrid of a saltwater male striped bass and freshwater female white bass, aka 'sunshine' bass. The other hybrid where the male and female are freshwater and saltwater respectively is referred to as a 'palmetto' bass. Due to declining wild populations in the 1970's farming of hybrid striped bass was established and has a track record of over three decades in the U.S.. Some of the annual striped bass produced in the U.S. is sold live, but the majority is harvested per customer orders and sold as whole, fresh product. This differs from imported striped bass which is almost always sold frozen. Hybrid striped bass has a milder flavor than wild bass and has pink, firm flesh. When buying fresh hybrid striped bass look for a sweet smell, bright red gills, and moist skin. Avoid buying product that has discolored or sunken eyes, an ammonia smell, or flesh that lacks firmness. A limited supply of hybrid striped bass is available year-round, although production is heaviest in the fall. Hybrid striped bass is a hybrid of striped bass and white bass. They are distinguishable from the striped bass by their broken (rather than solid) horizontal stripes. Their coloring depends on the water quality of their habitat. If the eggs come from white bass and the sperm from striped bass, the offspring is known as “sunshine bass” or “Cherokee bass” because they were first stocked in Cherokee Lake, Tennessee. If the eggs come from striped bass and the sperm from white bass, the offspring is known as “palmetto bass.” Optimum growing conditions are between 77°F to 81°F (25°C to 27°C). Hybrids grow quickly within the first two years, and can grow up to 22 pounds. Most are caught between two and five, or 10 to 15 pounds. They usually live up to five or six years, which is more similar to white bass than striped bass. Hybrid striped bass are usually harvested between 1.5 to 2.5 pounds in weight and 18 to 24 months old. Males mature at one year old, and females between two and three years old. Unlike most hybrid organisms, hybrid striped bass are fertile. Spawning occurs in the spring. Females produce between 65,000 and 200,000 eggs. The eggs float with the current for two to three days, until they hatch. The larvae do not begin feeding until five days old and are sustained during the intermediary period by a large oil droplet they can use as a food source. Flowing water is critical to the success of striped bass spawning because it keeps the eggs from sinking and becoming covered with silt that would eventually suffocate them. Hybrid striped bass are aggressive feeders, feeding on shad, bluegill, sunfish, minnows, and crappie. They are most active around dusk and dawn, when there is minimal light. Hybrid striped bass are a cross between the freshwater female white bass (Morone chrysops) and the anadromous male striped bass (Morone saxatilis). White bass are native to the Mississippi drainage while striped bass are native to the North American East Coast. Hybrid striped bass were first produced in the mid-1960s and were initially stocked in reservoirs in the southeastern United States. Now known as a popular sportfish, hybrid striped bass have since been introduced into rivers and reservoirs throughout the United States as well as Mexico, China, Taiwan, Russia, France, and Portugal. They are generally stocked into freshwater systems and are known to survive in a range of temperature and salinity conditions. Hybrid striped bass prefer temperatures between 77 and 81 degrees Fahrenheit (25 and 27 degrees Celsius), but can survive in temperatures ranging from 39 to 91 degrees Fahrenheit (4 to 33 degrees Celsius). They also do well in salinities from 0 to 25 parts per thousand with some being known to survive in higher salinity waters up to full seawater strength. Hybrid striped bass prefer slow moving streams, lakes, reservoirs, and ponds. They are pelagic by nature and thrive in more open water environments. Unlike some hybrids, hybrid striped bass are fertile and can successfully reproduce in the wild. High variability of commercially important traits, such as growth, feed conversion, stress resistance, etc. A 2016 study by the Iowa Department of Natural Resources (DNR) researches the effect of fish barriers on the ability of hybrid striped bass to move out of their home lake. The hybrids, like striped bass, seasonally move upstream into tributaries, and recent observations show them moving downstream in rivers through dams. This movement reduces the effectiveness and increases the cost of stocking programs undertaken by Iowa’s DNR. Determining the effectiveness of barriers by tracking fish movement can help build better stocking strategies for hybrid striped bass. Iowa’s DNR has implemented Passive Integrated Transponder (PIT) tag readers at the spillway of Big Creek Lake, enabling identification of all PIT-tagged fish that leave the lake. The infrastructure for this project was put in place as part of an on-going walleye study. Hybrid striped bass is one of the largest aquaculture sectors in the United States. The majority of hybrid striped bass are farmed in earthen ponds throughout the western and southern regions of the US – with some production occurring using recirculating aquaculture systems. The vast majority of hybrid striped bass are sold within the US and Canada. Hybrid striped bass are considered to be fast growing and resilient – making them an ideal aquaculture species. 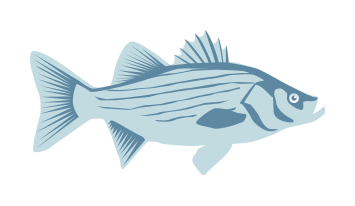 Private associations such as the Striped Bass Growers Association, the National Aquaculture Association, and the US Chapter of the World Aquaculture Society also develop environmental codes of conduct and best management practices for hybrid striped bass production. These codes and guidelines often follow the Food and Agriculture Organization of the United Nations (FAO) Code of Conduct for Responsible Fisheries. Hybrid striped bass facilities must follow U.S. Environmental Protection Agency regulations for aquaculture effluents that require facilities to treat wastewater. The likelihood of escape from the ponds and tank systems where the hybrids are raised is low. The majority of hybrid striped bass are raised in the United States in ponds with the remaining raised in tanks and cages. Tanks are either closed systems or flow-through, and effluent is usually treated before being discharged. Since the fish are resistant to diseases already, few if any chemicals are needed to treat them. The tanks and ponds where hybrid striped bass are grown are primarily located inland in the United States, and not in ecologically sensitive areas. The majority of hybrid striped bass are raised in the United States in ponds with the remaining raised in tanks and cages. The tanks and ponds where hybrid striped bass are grown are primarily located inland in the United States, and not in ecologically sensitive areas. This carnivorous species is fed a diet of 18-35% fish meal and the rest is made up of grain-based proteins. The primary source of fish meal is Atlantic menhaden, a fish that at last assessment was not being overfished. The U.S. Department of Agriculture and the National Oceanic and Atmospheric Administration are collaborating on an initiative to find viable alternatives to fish meal for aquaculture production. While hybrids are susceptible to the same diseases as wild striped bass, the risk of transmission is not known. The likelihood of escape from the ponds and tank systems where the hybrids are raised is low.